Today I'm taking a look at the Acebeam H40, a small dedicated headlamp. It runs on a single AA cell, or a 14500 for more power. It uses a ramping UI, and is made almost completely of aluminum. There aren't many single AA headlamps, and almost none with a high CRI option, so this is pretty unique! I like this headlamp a lot. 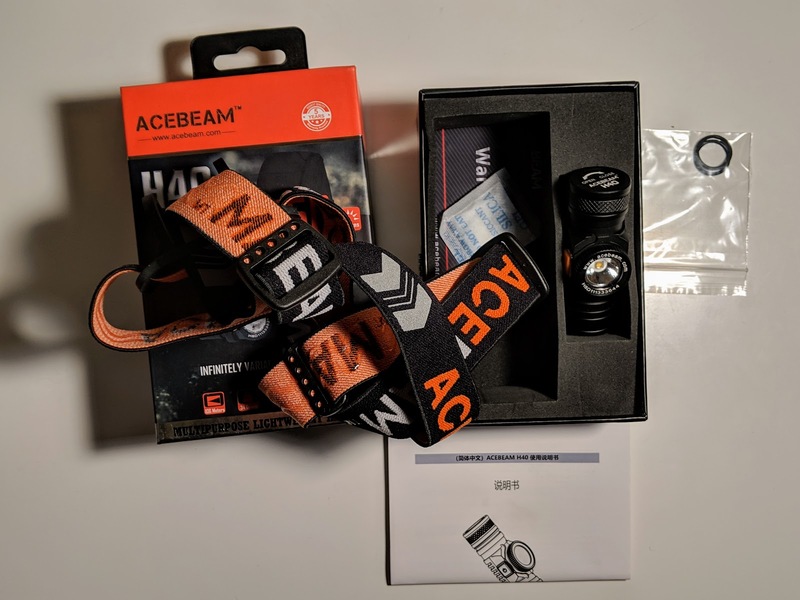 For people who don't want something the size and weight of a more powerful 18650 headlamp, I think it's one of the most compelling options on the market. It's well built, has a wide range of brightness options, and the light it puts out is great. This light will definitely be coming with us on the next backpacking trip. The light measures 64.7 mm wide, 26.6 mm from front to back, and 21.4 mm tall. The weight of just the light is 37 grams. Adding a NiMH cell brings that to 67 g, and the "trail weight" with that same AA and the included headband weighs in at 112 g.
As a dedicated headlamp, there really isn't too much to say about the body of this light. It's made of black anodized aluminum for the most part, and the anodizing is good. The top of the light shows the shape - mostly just a tube with a reflector on the side. There's an orange switch held in place with a silver ring. There's also a few shallow grooves on the back side of the light. Usually these features are to help with cooling, but this location suggests they might just be for aesthetics. The one end that is removable to swap cells has some simple knurling to help differentiate it, and to help with grip. Around the front, the bezel has some reeding around the perimeter and appears to be screwed into place. It also seems to be glued in place, but I'm sure someone could get it open if they really wanted to. Since I approve of the emitter this one came with, I didn't try all that hard to open it up. The bezel has the company's site and a serial number etched into the anodizing. The bottom of the light is a mirror image of the top, with a "HOT" label in place of the switch. Around the tail of the light, if you can call it that, the regulatory markings can be seen. This side does not open readily. The opposite end of the light is labeled with instructions on how to get at the cell, alongside the product name. Inside, we can see a spring that serves as the negative contact, and a brass button for the positive one. The threads are surprisingly thick and square, and look very large in contrast to the tiny size of this light. They're also anodized, so the light can be locked out from accidental activation with a slight twist. This is very much a dedicated headlamp. Although you can pop it out of the headband, it really isn't designed to be used that way. The headband mount included does a good job of keeping the light in place, but I found it difficult to rotate the light - especially while wearing gloves. The button can also be difficult to use with gloves on. Part of this is likely due to the very compact size of the light itself. The headband is very comfortable, and features both a grippy silicone aplique on the inside and reflective detailing on the outside. 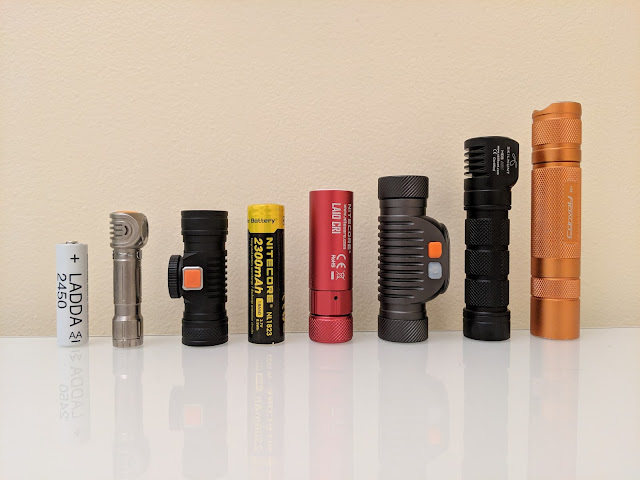 I wouldn't mind seeing a magnet added to one end of the body - I have another high CRI headlamp in for testing with this feature, and it's certainly useful. That being said, it's not something the camping market this headlamp seems targeted at would usually use. Many hikers that navigate with a compass are wary of magnetic interference, so I understand the decision to leave it out. The most important thing with this light is that a single press from off turns the light on at the last used 'main' brightness, and another single press turns it off - great stuff. Long press from off turns the light on in ultra-low mode, claimed at 5 lumens. Double press from either on or off turns the light on in turbo. Triple press to get to the SOS flash - I don't think I'll ever use this feature, but I'm glad it's not going to be accidentally activated. While the light is on, holding ramps through the main levels smoothly. This is a great feature, but at both ends of the ramp the light flashes on and off a bit obnoxiously. I wish this flashing was a bit more subtle, as it is in other ramping lights like the Astrolux S43 or the Emisar lights. The light also has an electrical lockout accessed by holding the button longer than 3 seconds, but I prefer to loosen the tailcap. The SST-20 chosen for this light is very warm, and very high CRI - a claimed 95+. This is a smaller LED and it makes a beam that's a bit more direct than I'm used to in headlamps, which has some benefits. This beam shape means I need to use the higher modes a lot less often, and also helps shine further down the trail. The downside is that close-up work like cooking means there's a very bright hotspot and the spill around it is noticeably dimmer. The headlamp can run on either an AA cell, or a Li-Ion 14500 cell. 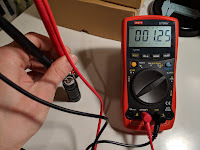 Standby drain on the cell when the light is off was measured at 3.57 μA on 14500, which would take about 20 years to drain the 650 mAh cell I tested with. With a NiMH cell, standby drain was measured at 1.25 μA, which will also have a negligible impact on standby life. 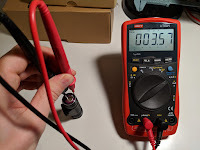 Both of these are low enough that the cell's self discharge will likely be a bigger issue, but you can of course back off the cap slightly to physically disconnect the cell. Runtime was first tested with an Ikea Ladda NiMH AA, as I expect this to be the more common use. Ouptput on high and turbo were both very stable, with no step downs noted. Turbo lasted 85 minutes, and high lasted 96 minutes, both of which just slightly exceed the manufacturer's specifications. On turbo, the light flashed around a bit after initially dropping down, but wasn't very usable at this point. Turning the light off and on again allowed a few more minutes of use on a lower mode. With an Efest 14500 cell, the turbo output drops drastically after about a minute (as advertised). Turbo settled around 40% and stayed stable for the remainder of the run, dropping below 10% after 62 minutes, and again fluctuating before staying off. High was stable for 109 minutes. Again, both of these runtimes look great, and easily exceed the advertised values. It's interesting to note that, aside from the initial spurt on turbo, 14500 and NiMH performance is so similar. 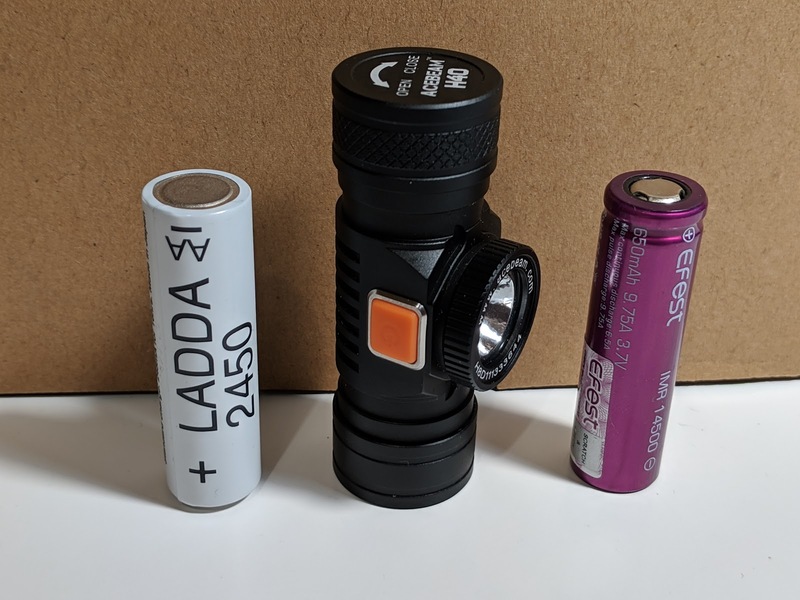 This changes at the lower modes - the low end of the ramp claims 20 lumens for 7 hours on a 14500 cell versus 16 hours at the same level on NiMH. Unless you need the turbo output, NiMH seems like the better option for this light. 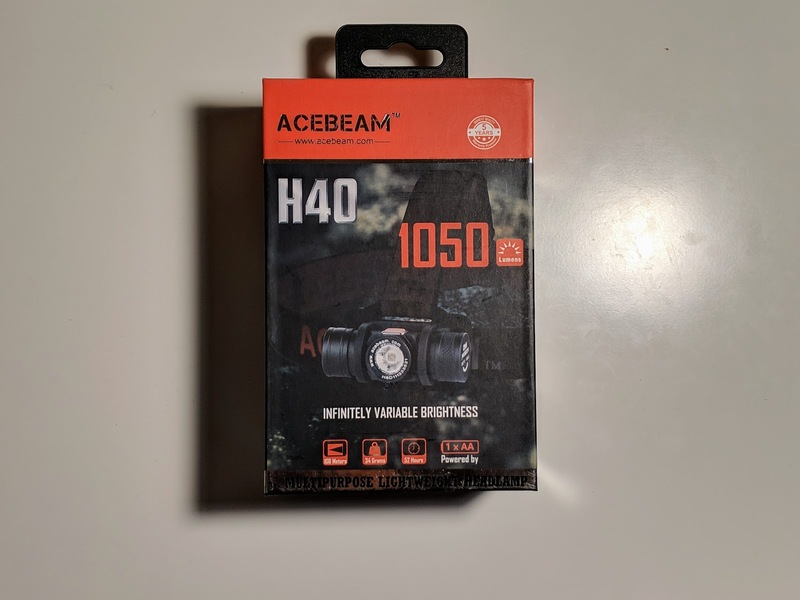 This product was purchased from Illumn. I was not paid to write this review, and have tried to be as unbiased as possible.